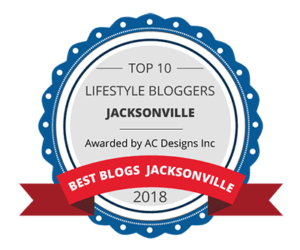 Have you ever thought about what kind of new diet fads are going to be around in the next 10 years? I mean seriously, when I was a kid you either ate meat or you didn’t. To be quite honest, fad or not, I’d be a pescatarian if the lifestyle wasn’t too expensive to maintain. In fact, I’ve tried it once before. My grocery bill got a little too pricey for me to keep it up though… and I missed chicken. 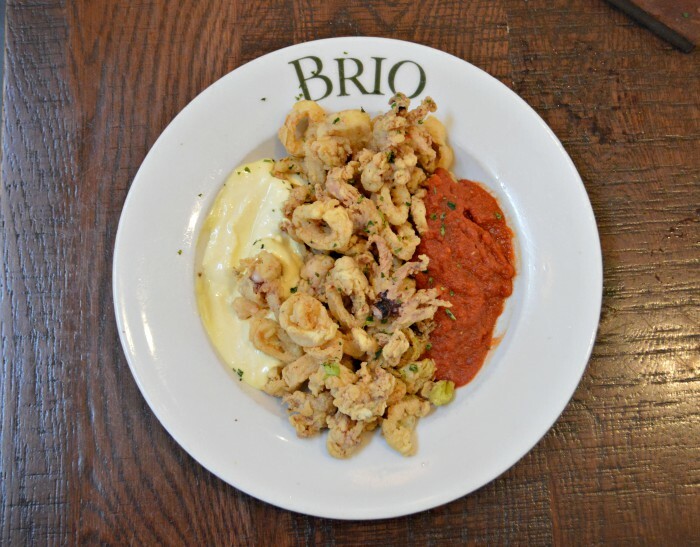 Anywho, I love seafood so when I was recently invited to Brio Tuscan Grill to try out their new seafood celebration menu, I was ALL IN! 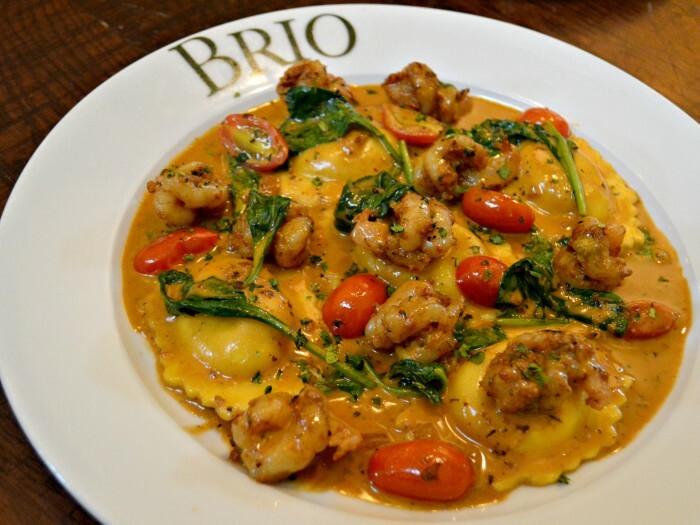 I love Brio and have always had pleasant dining experiences there. As I’ve mentioned before, they truly live up to the meaning of their name, “lively” or “full of life” and it definitely shows in their food! 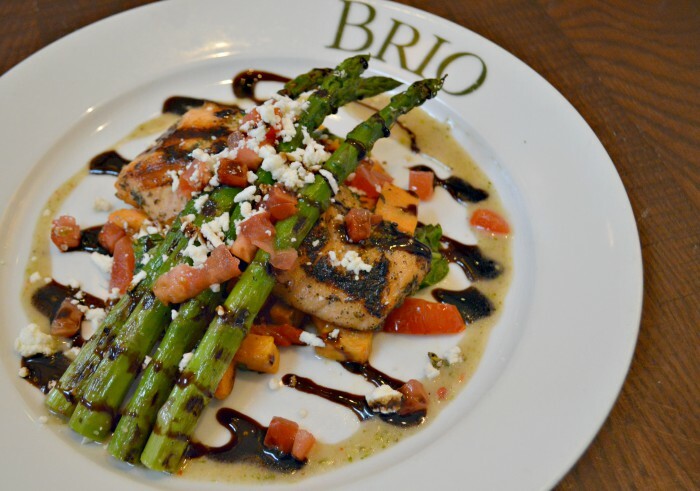 From now until June 17th, you can enjoy the new Spring menu at Brio! If you love seafood, you’re going to be hooked, pun intended, because each and every one of these seafood dishes are delicious! 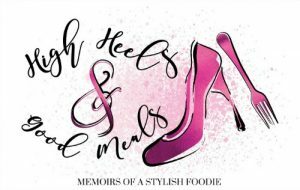 There are certain things that are must-haves when I dine out. For some that’s appetizers and for others it might be dessert. For me, it’s a cocktail or glass of wine and what’s better than one cocktail? Three cocktails! 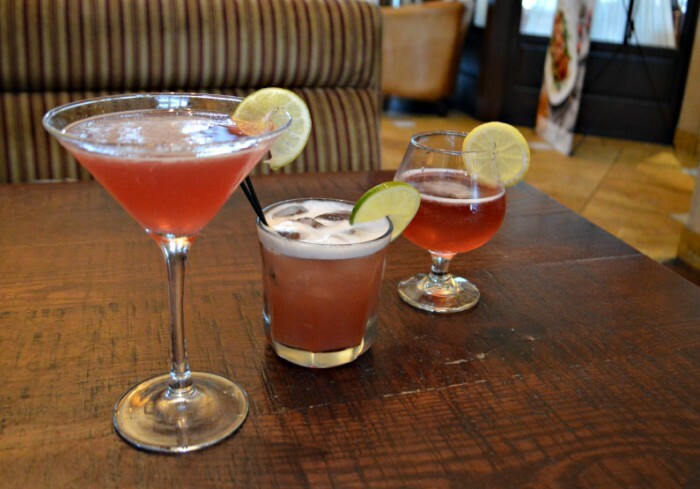 My friend and I sampled all three of the new cocktails from the new Spring menu and all of them were light, fresh, and tasty! This was my friend’s favorite cocktail. It was a blackberry and pineapple infusion with black raspberry liquor, lime juice, and basil simple syrup. Blackberry infusion with rum, black raspberry liquor, pineapple and lime juice, and basil simple syrup. This was my favorite. It reminded me of a wine cooler. It was a blackberry infusion of black raspberry liquor, Moscato, lemon, and lemon & lime juice. 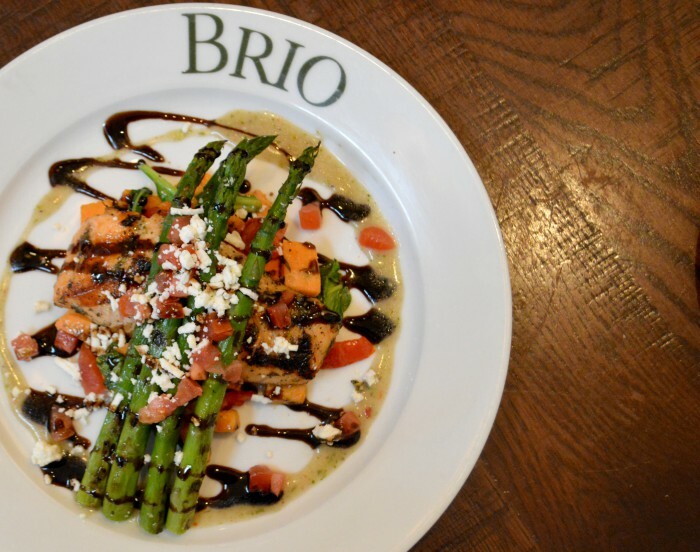 I love that Brio switches up the bruschetta every season. This spring bruschetta is dangerous. I believe I ate 4 of them while we were waiting on our main course. 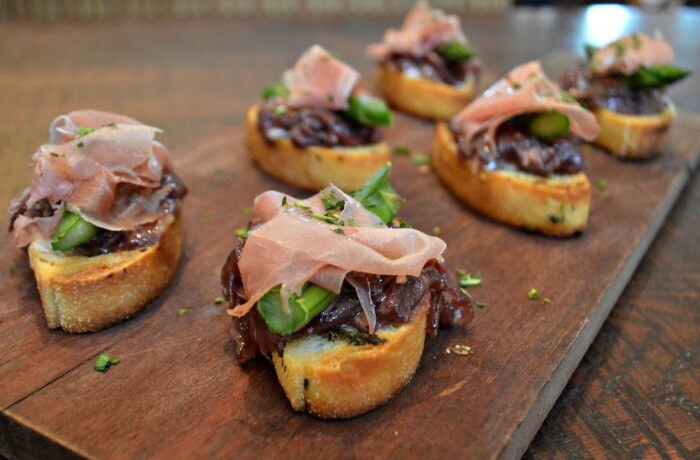 These delicious little pieces of Italian bread were topped with olive oil, cheese, red wine cooked onions, asparagus, and proscuitto. Ummmmm…AMAZING! I usually don’t care much for calamari, but these were pretty good. They were fried to a golden brown with pepperoncini, and aoili and pomodoro sauce for dipping. It was a perfect starter for the seafood dinner coming up! This dish was so beautiful to me! I am going to try to recreate this at home. Not only was is appeasing to the eye, it tasted great too. The salmon was grilled and seasoned to perfection and topped with grilled asparagus, sweet potatoes, spinach, red peppers, pesto vinaigrette, Feta cheese, tomatoes, and finished with a balsamic drizzle. This dish was pretty light and very flavorful. 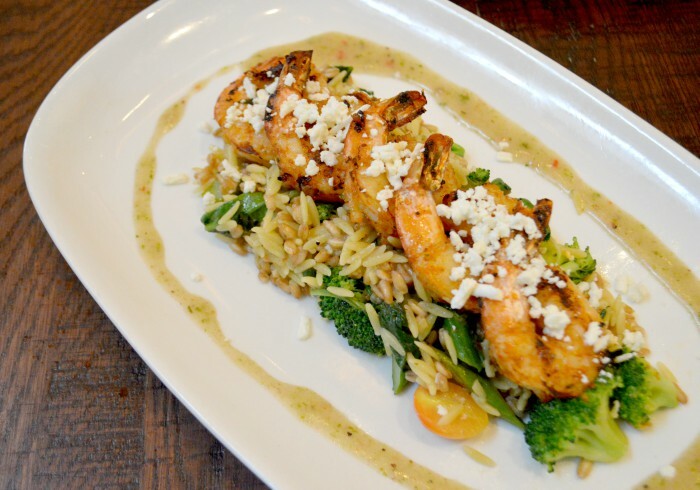 The shrimp were grilled and had a little kick. They were on a bed of orzo, farro, broccoli, asparagus, grape tomatoes. spinach, Feta, and a pesto vinaigrette. This dish was AMAZEBALLS! It came with the same spicy black pepper cream used in the Spicy Shrimp & Eggplant dish and I could literally drink the stuff it’s so good! The ravioli were full of the lobster and shrimp mixture and there were loads of spinach and tomatoes throughout the dish. Seriously guys, this dish is everything! 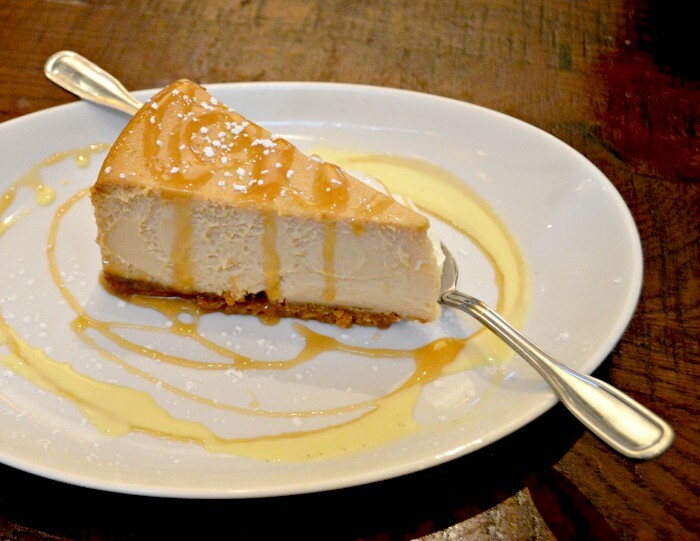 As if we could handle anything else after the amazing meal, we were brought the seasonal Creme Brulee cheesecake. It was made with vanilla bean, caramelized sugar, and a drizzling of caramel. It was delicious and incredibly decadent! We shared it and still couldn’t finish it. As always, I thoroughly enjoyed dining at Brio. Everything is always deliciously prepared. As I mentioned earlier, the Spring Seafood menu will be available until June 17th so you can take your mom for Mother’s Day, your Dad for Father’s day, and your friends and family members for a Graduation dinner! It is that time of year ya know! If you do, you can partake in the gift card promotion Brio is having during this time. For every $100 spent in gift card purchases, guests will receive a free $25 bonus card that can be used towards all of these amazing dishes! 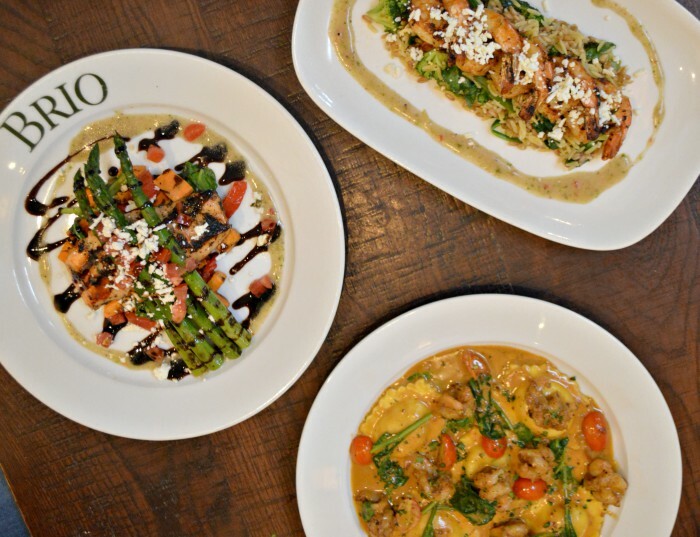 Head over to Brio’s website and read more about their new menu, purchase a gift card, and make your next dinner reservation and as always, thank you for stopping by! Have a fabulous day!